Monika O'Neill - monstampincorner.com-By the Shore Designer Series Paper-Bear Hugs Bundle-sentiment from Marquee Messages- Stampin'Up! current catalogue 2016-2017. Hi everyone, todays card is a box card I made, male cards for some reason seem to always be a bit of a challenge, I think its because the lack of glitter or pearls or all the pretty things we like to embellish our cards with. To make the card I used black cardstock, for the mats I used By the Shore Designer Series paper and for the Bears and Fish I used the Bear Hugs bundle, you save 10% by purchasing in bundles. 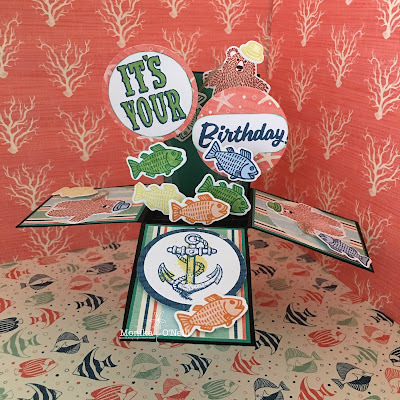 If you would like instructions on how to make this card you could come to one of my classes or leave a comment and let me know. I have listed the products I used below, if you need any of them just click on what you want and it will take you to my shop. I hope you enjoyed todays card. See you soon. AWH Designer Series Papers Blog Hop!